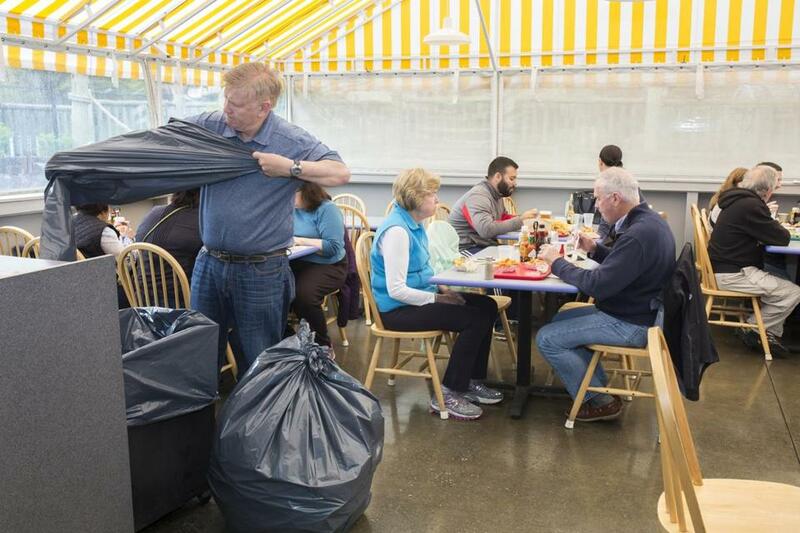 Nathan “Nick” Nickerson, the owner of Arnold’s, a restaurant, clam shack, and mini golf place in Eastham, switchef out trash bags during Friday’s busy lunch hour before Memorial Day Weekend. On Nantucket last weekend, an innkeeper cleaned the pool while his sales director drove the shuttle bus. Restaurant co-owners in Provincetown filled in as cook, hostess, and cashier. At Arnold’s Lobster & Clam Bar in Eastham, the owner was out on the patio busing tables, the office manager was in the kitchen making lobster rolls, and the head chef was slinging drinks behind the bar. With the unofficial kickoff of the summer season upon them, Nickerson and other employers on the Cape and Islands are scrambling to make up for a shortage of foreign workers created by a change in the seasonal visa program. Many summer business owners have pushed back their opening days and are calling on department heads, former employees, family members — and themselves — to perform tasks normally handled by experienced, longtime employees from Jamaica, Eastern Europe, and beyond.Temporary workers are filling in some of the gaps, but overtime costs are already piling up. If more workers aren’t allowed into the country before the season ramps up in July, employers worry that they may have to close sections of their hotels and restaurants, cut back their hours, or shut down earlier than usual in the fall. And if the shortage leads to long lines or unhappy customers, the financial fallout could be severe. Unlike the previous year, Congress last fall failed to reauthorize an exemption that removes returning foreign workers from the annual H-2B visa cap of 66,000. A low unemployment rate also means fewer Americans are in need of work, which is driving more employers to seek foreign help. The Cape Cod Chamber of Commerce anticipates a loss of about 1,000 foreign workers out of a 15,000- to 20,000-member seasonal workforce because of the changes. Nationwide, the number of foreign workers requested grew by nearly 52 percent between fiscal years 2012 and 2016, and is on track to increase even more this year. Petitions for 50,513 workers were filed in the first week of January alone, far exceeding the 33,000 visas allowed for summer help. Earlier this month, Congress authorized nearly doubling the national annual cap, to about 130,000 for all H-2B workers, including returning employees, but the final decision is up to the Department of Homeland Security, and no action has been taken. Even if the increase is approved soon, it could take at least a month to get workers here because they have to be vetted by immigration authorities, and by then the season will be in full swing. Employers around New England are dealing with the foreign-worker shortage, but the problem is especially acute in Massachusetts. Only Texas, Florida, and Colorado asked for more H-2B visas last year. Mark Carchidi, a Yarmouth Port attorney who filed H-2B petitions on behalf of more than 150 businesses around New England this year, said two-thirds of his clients didn’t get their workers. Normally, they all do. Nathan “Nick” Nickerson’s restaurant, Arnold’s, did not get any of the eight H2B slots it applied for and is therefore very shortstaffed as it enters the busy season. Employers stress that Americans don’t want to wash dishes, scrub toilets, and mow lawns, jobs often done by foreign employees. While business owners are required under the visa program to recruit and advertise jobs to US workers first, with wages set by the Department of Labor, many get no responses. High school and college students fill many of the seasonal jobs, but they often can’t start until June and have to leave before Labor Day. Foreign workers, on the other hand, come in April and stay through the increasingly important “shoulder season” in the fall, and are often the most experienced and dependable workers, employers say. They’re here to make money— not go to the beach — and are willing to put in long days. 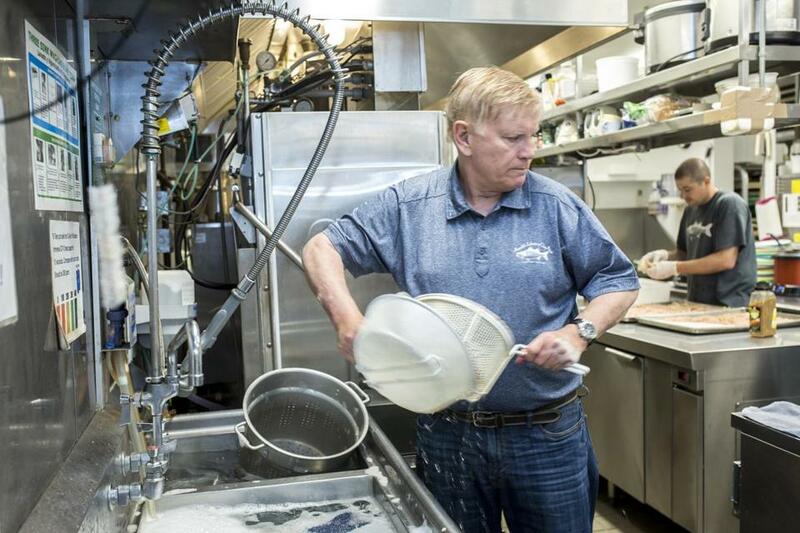 Darin Janoplis, co-owner of the Mayflower Cafe in Provincetown, built by Janoplis’s grandfather in 1929, was in the kitchen on a recent weekday, filling in as head line cook. Janoplis, who did not get 17 of the visa slots he filed for, said he’s hired every American who has come through the door but is still short. One of the things that worries him the most, he said, is not being able to take care of his customers, up to 300 a night during the height of the season. Foreign worker visas have become a “political football,” said Patrick O’Neill, a principal at Public Strategies Washington Inc., a public affairs firm that represents a coalition of seasonal businesses in New England. Labor groups on the left are wary of them, contending they depress wages and can lead to worker abuse. Some groups on the right don’t like them because they bring in foreigners who may stay on illegally. And, with increased anti-immigrant rhetoric from President Trump, no one wants to appear to be on the wrong side of the “Buy American, Hire American” mind-set. US Representative Bill Keating, whose district includes the Cape and Islands, said Republican leadership didn’t want to deal with the controversial visa program so they passed it off to Homeland Security. But that line of thinking is misguided, he said. Small business owners contend that the visa limitations are not just hurting their ability to do business, they’re hurting vendors as well. In addition, state and federal governments will collect less in taxes. Everything but the most pressing matters are being neglected, said Scott Thomas, general manager of an inn on Nantucket who got none of the 22 visa slots he sought for housekeeping, laundry, dishwashing, and maintenance work. If the crisis mode continues and leads to shoddy customer service, it could harm the local economy, said Steve Lam, owner of the Wellfleet cleaning and linen rental company the Furies, who has managed to fill a few open positions but is still in need of foreign workers.